'That is why we call for the democratization of the Security Council. This is desirable for the enthronement of justice, equity, and fairness; and also for the promotion of a sense of inclusiveness and balance in our world,' President Jonathan said. 'Our world continues to be confronted by pressing problems and threats. No statement that will be made during this Session can exhaust the extent of these problems. The world looks to us, as leaders, to provide hope in the midst of crisis, to provide guidance through difficult socio-political divisions, and to ensure that we live in a better world. The reign of terror anywhere in the world is an assault on our collective humanity. Three days ago, the stark reality of this menace was again brought to the fore by the dastardly terrorist attack in Nairobi, Kenya. 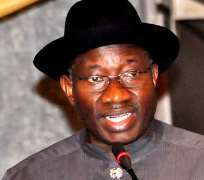 We must stand together to win this war together,' President Jonathan said.